Monty came into the rescue on 30th November 2010 via one of the RSPCA Inspectors as he was found as a stray in the grounds of a school. The location was very remote, so it is believed that he may have been deliberately dumped at the school. Monty was very lucky to have been caught so that he could be brought into the rescue. 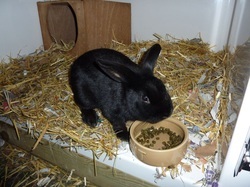 He was neutered on 9th December 2010, so is now waiting for a new home with a neutered female. Monty deserves a good home. He has lots of energy, but will sit for cuddles. He is getting very bored being on his own and chews up all his bedding. He desperately needs a companion to alleviate his boredom. As he is a stray we do not know how old he is or any other history.